Archbishop John MacHale: thrown off balance by the arrival of the Protestant mission on Achill Island. The Catholic archdiocese of Tuam, traditionally founded by St Jarlath in the sixth century, is the largest in the country. It stretches from Achill Island to the River Shannon, some 120 miles (193km ). In the 1830s its cultural diversities, long distances on bad roads, and its poverty compared to the more prosperous eastern end of the archdiocese, allowed the island community of about 6,000 souls to be neglected. That neglect was seized upon by the Rev Edward Nangle. He had a vision of creating an exemplary Christian Anglican colony there, ‘the most deprived and remote location’ of its time. Nangle, was unwavering in his determination to bring the Bible, and a ministry of service in education, literacy, medical services and economic development to a ‘wretched people’. He was convinced, and he convinced a band of followers, that this model Christian development, which he had seen in a vision, would be an example to the world of how ‘to lift a people out of poverty, ignorance and idolatry through an evangelising crusade’. Initially he succeeded remarkably well. Within a short space of time, having obtained land from the local landlord, he built roads, several attractive houses, two schools, a church, a dispensary, a pier, and an hotel. MacHale must have been shocked and appalled when he was made fully aware of the extent of Nangle’s infiltration. Not only had the archbishop failed the Catholics on Achill, but he faced humiliation from his enemies within the Irish hierarchy with whom he was having a major public row over their acceptance of the new national school system proposed by John Russell, the Home Secretary. 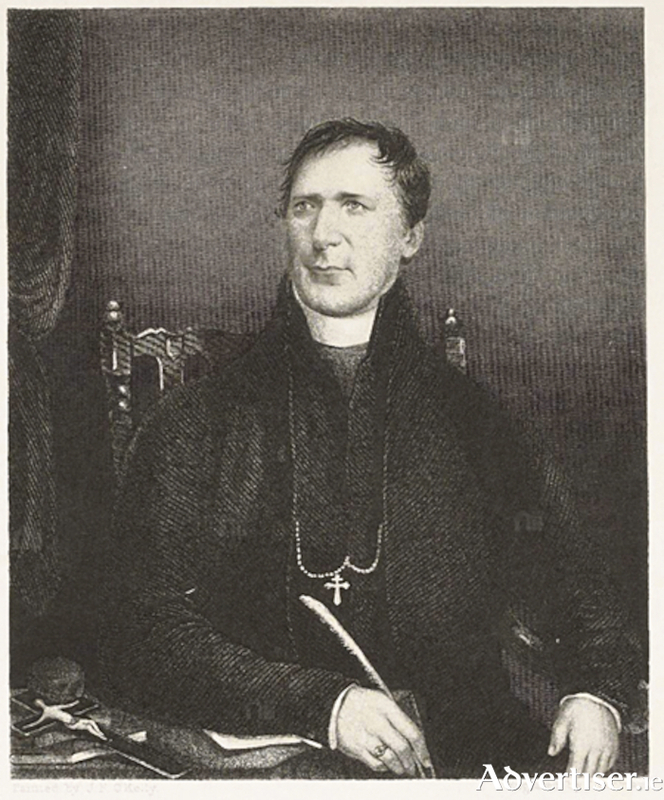 Most bishops agreed that the new John Russell system gave them certain powers over schools including the appointment of teachers, and a say in the subjects taught. But MacHale insisted that this was a false compromise. He favoured leaving the education of boys to the Christian Brothers and the Franciscan friars; and the education of girls to the nuns. Now faced with the emergency on Achill, the opening of two new Protestant schools, he urged the local parish priest to quickly open schools for Catholic children as fast as he could. For a ridiculous, but short lived, period (and I am sure to the amusement of the islanders, who, in pre-Great Famine times, were never really convinced of Nangle’s dream ), enjoyed the choice of five Catholic, and two Protestant schools for its 400 children. John MacHale (1791-1881 ) was born of prosperous farming stock in Tubbernavine, Co Mayo. It was an Irish speaking family but his father Patrick insisted that all his six children learned English. As a boy MacHale saw French troops under General Humbert pass by their door. He was later traumatised when he witnessed the execution of their parish priest by the Redcoats. At Maynooth he was regarded as a brilliant scholar, excelling in languages, and English literature. He began a life-long career of writing scathing and often admirably argued, letters to newspapers, and magazines in both Britain and Ireland, under the pseudonym ‘Hierophilos’. Many of these writings infuriated the British authorities to such an extent that when it heard that MacHale was being considered for the archbishopric of Tuam it vigorously complained to Pope Gregory XVI, that he was a trouble maker and unacceptable to them.Gregory ignored the appeal. MacHale gave unstinting support to O’Connell for his Repeal the Union campaign, and would be ever after regarded as the people’s man; and very much associated as a powerful advocate for the national cause. But no matter how clever he was at argument, or how powerful he was in character and authority, the arrival and success of the Rev Edward Nangle on Achill threw him off balance. In fact both men, as they confronted each other over the years, would lose the run of themselves. The Christian ideals of faith, hope, charity, tolerance, and love for your fellow man were thrown out the window. The hatred stirred up by the Archbishop and his priests were to have tragic consequences for the Protestant chief officer of the coast guard, Francis Reynolds. NOTES: Among his other translations, MacHale translated Homer’s Illiad into Irish. Although he spoke several languages fluently, all his sermons were in Irish. I am leaning on Patricia Byrne’s The Preacher and the Prelate - The Achill Mission Colony and the Battle for Souls in Famine Ireland, published by Merrion Press, on sale €14.95, and Colin Barr’s essay on MacHale in the Dictionary of Irish Biography.